By Craggs, Chris and Alan James. Rockfax. 2013. 456 Pages, 42 Areas, 2300+ Routes, Full colour throughout. 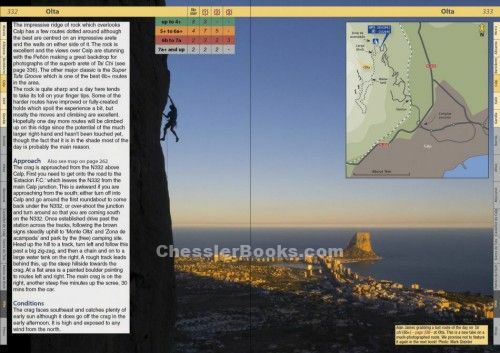 Dedicated exclusively to the Costa Blanca, this is the most comprehensive book ever published to sport and trad climbing on Spain�s �white coast� � weighing in at 456 pages and covering a host of superb cliffs between Leyva in the far south to Gandia in the north. With well over 2300 routes described in detail, this book will keep any ardent sun-rocker busy for years. There is a significant number of new crags which partly account for additional pages, perhaps the best being Mula. With about 100 routes and a wide spread of grades this justifies the inclusion of the southern area, which includes Leyva, Orihuela and La Panocha, and is worthy of a separate trip in itself. Guadalest is a picturesque fortified town, some 20km inland, perched above mainly-sunny crags. A range of very well bolted single or multi pitched routes, mostly in the fives and sixes, make at least one visit compulsory for most. Alternatively, you could spend time in the town stocking up on a wide range of completely unnecessary tourist tat! Another significant addition is Castellet de Calp (formerly know as Calpe!) a north-facing crag, close to town, which will be useful for those visiting in spring or autumn. As well as these there are two or three other new crags in addition to new routes on old crags. A few crags have been dropped from the book but, to be honest, you won't miss them! Perhaps the most obvious change in the book is that almost every photo-topo has been re-photographed and the routes redrawn. For single pitch routes this may help a little but it is on the longer routes that the greater quality and accuracy is most significant in reducing route-finding difficulties. This must have taken a huge amount of time and effort but, in the day-to-day use of the guidebook, it will make a difference. The Costa Blanca has become renowned as Europe�s premier winter sun rock venue, with a great climate, bags of accommodation, cheap flights and enough high quality climbing to last a lifetime. As well as covering the clip-ups on the ever-popular cliffs around Benidorm and Calpe, the book details big outings on the Puig Campana, The Penon, and the Echo Valley area. Format - A new set of high resolution digital photographs has been assembled, and on the rare occasion where this has proved impossible, detailed full-colour topos have been used. Some of the full-page crag shots are a breathtaking revelation. Include 50+ dramatic action photographs and this book will set the standard for years to come. The Costa Blanca has become renowned as Europe�s premier winter sun rock venue, with a great climate, bags of accommodation, cheap flights and enough high quality climbing to last a lifetime. As well as covering the clip-ups on the ever-popular cliffs around Benidorm and Calpe, the book details big outings on the Puig Campana, The Penon, and the Echo Valley area. The guide also has many areas never covered before by Rockfax.